At the time this article was written, Dr. Kuo was an Assistant Professor, Department of Diagnostic Radiology, Yale University School of Medicine, New Haven, CT. He is currently an Associate Professor, Department of Medicine, Hematology/ Oncology Section, University of Arizona School of Medicine, Tucson, AZ, and a Staff Radiologist, Southern Arizona Veterans Administrations Health Care System Tucson, AZ. Dr. Chen is an Associate Professor and Dr. Weidhaas is an Assistant Professor, Department of Therapeutic Radiology, Yale University School of Medicine, New Haven, CT. 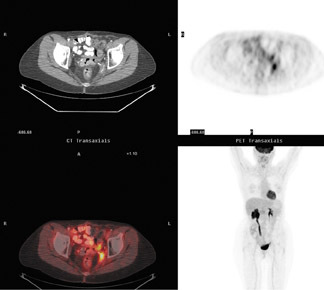 Both 2-deoxy-2-[F-18]fluoro-D-glucose (FDG) positron emission tomography (PET) and PET fused with computed tomography (PET/CT) are emerging as the standard of care for the staging, monitoring of response to therapy, and detection of disease recurrence for numerous malignancies. PET is increasingly being used to alter the management of patients by detecting a suboptimal response to therapy and thereby directing an intensification or switch of therapeutic regimens. 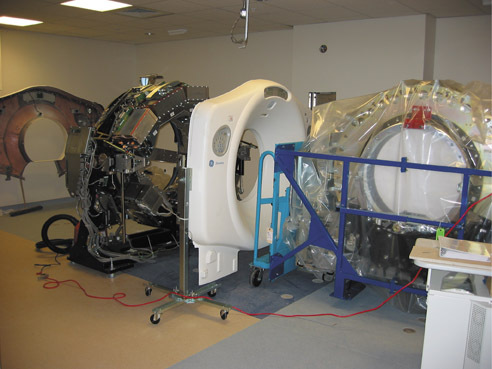 Since the introduction of the first PET/CT camera for clinical use in 2000, PET/CT has proven to add sensitivity and specificity as compared with PET alone for a variety of malignancies.1-6 The PET/CT camera provides an inline hardware fusion of the functional imaging from PET with the anatomical detail from CT. 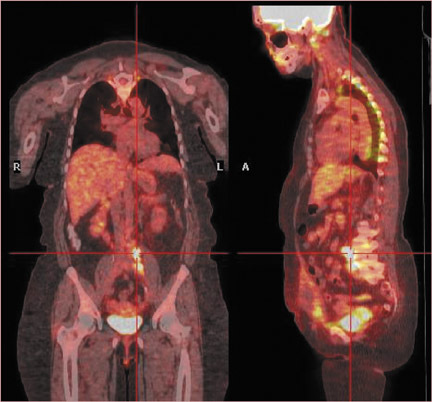 Reaping the benefits of PET/CT technology for the optimization of planning of radiation therapy (RT) requires a melding of sophisticated fields that took time to develop but can now be readily accomplished. For optimal collaboration, both the radiologist/nuclear medicine physician and the radiation therapist need an understanding of the basic principles of FDG-PET/CT and RT. 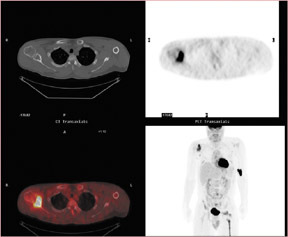 In this article, a protocol for the integration of PET/CT into treatment planning of radiotherapy is provided as a model that can be fine-tuned to meet the equipment and requirements of each institution. 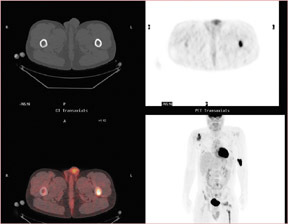 Subsequently, cases are presented to illustrate the 4 crucial concepts of FDG-PET/CT in planning RT. First, FDG-PET/CT may alter treatment decisions. Second, FDG-PET/CT improves treatment planning. Third, FDG-PET/CT may be used to assess response to therapy. Fourth, not recognizing pitfalls in the interpretation of FDG-PET/CT can have disastrous implications. PET utilizes special radioactive isotopes, which are mostly produced in cyclotrons. 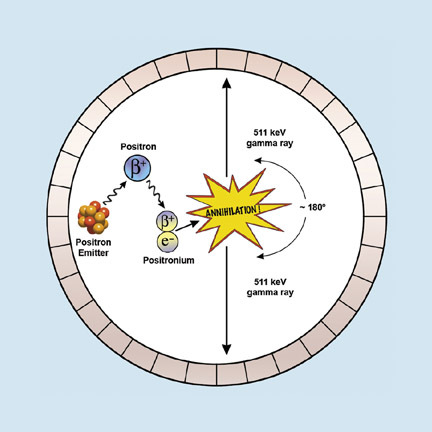 PET isotopes emit positrons (positively charged electrons) that annihilate with electrons to produce two 511-keV gamma rays directed approximately 180˚ apart. The PET camera is a ring of detectors that accepts “true” counts that arrive within a narrow time window (coincidence detection) and at opposite detectors 180˚ apart (Figure 1). As with all of nuclear medicine, the PET scan is defined by the injected radiotracer. 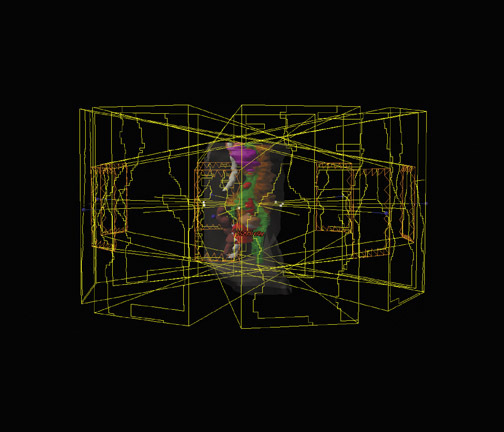 FDG is by far the most widely used PET radiotracer. As the chemical name suggests, FDG behaves as an analog of glucose and is transported into the cell through glucose transporters. FDG is injected intravenously, and the patient is imaged approximately 45 to 60 minutes after sitting quietly. The PET camera localizes and quantifies the accumulation of FDG within the patient. Tumors have higher rates of glucose metabolism and, therefore, have increased FDG uptake in comparison with the normal surrounding tissue. 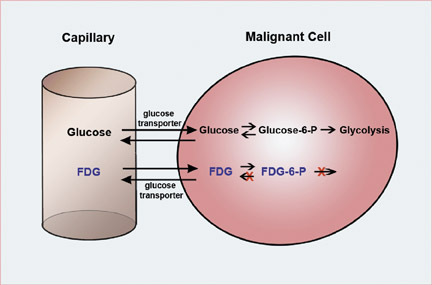 The substitution of the fluorine into the glucose molecule results in biochemical trapping of FDG in the malignant cell (Figure 2). How does radiation kill cells? “Packets” of energy are deposited into biological material, leading to cell death. There is overwhelming evidence that deoxyribonucleic acid (DNA) is the target, which is confimed by the observation of a 1-to-1 correlation of visible lethal chromosomal aberrations and cell death. 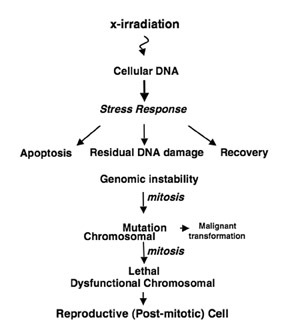 10 While there are many forms of immediate cell death following radiation, including apoptosis and autophagy, it is firmly believed that the most significant form of cell death in solid tumors is a delayed form of cell death referred to as reproductive cell death (Figure 5). 11,12 This is a unique genetic form of cell death caused by ineffective DNA repair and requires several cell cycles before cells undergo death. Despite the efficacy of RT, >50% of patients diagnosed with cancer will die of their disease, with local failure being common. There are several factors contributing to this poor outcome, including inadequate tumor identification, inadequate staging of nodal or metastatic disease, inadequate tumor targeting due to unidentified nodes or inaccurate borders of tumor, and inadequate dose or tumor resistance. PET/CT can help in all these areas. First, PET/CT is superior to CT and PET alone in the evaluation of nodal and metastatic disease. 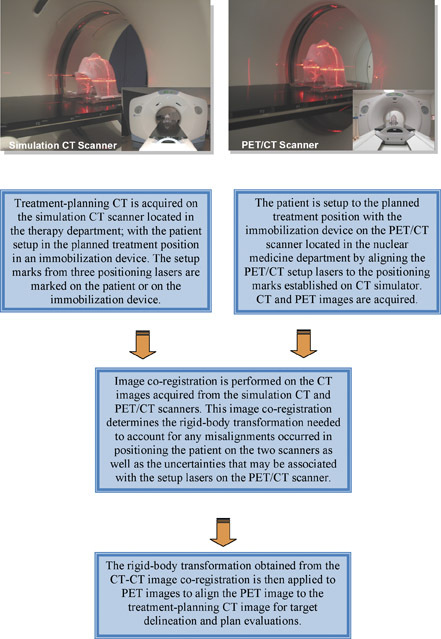 1-6 Additionally, the coregistration between planning CT and PET/CT improves lesion localization and identification for optimal targeting of tumor. PET/CT alters radiation treatment planning in up to 45% of patients and also leads to changes in tumor volumes in 30% to 50% of patients. 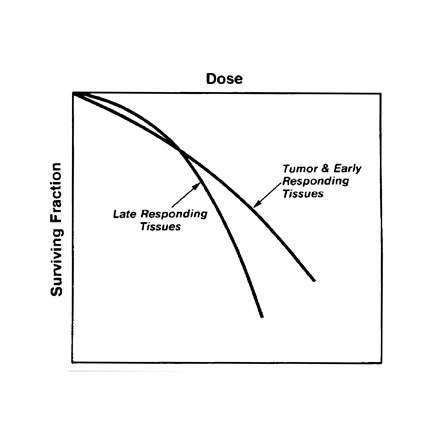 13 To overcome the issue of inadequate dose, the radiation oncologist must attempt to increase the therapeutic ratio to avoid normal tissue complications while increasing the dose to the tumor and, ultimately, increasing local control (Figure 6). Increasing the therapeutic ratio can be achieved by intensity-modulated RT (IMRT), which allows the delivery of highest doses to the tumor while minimizing the dose to normal tissue. A protocol for melding PET/CT with radiation treatment planning requires optimization for the nuances of each center. At our institution, the departments of nuclear medicine and RT are on different wings and floors of the hospital. Figure 9 presents our protocols, which can be used as a template to be modified for another specific institution. The functional data from FDG-PET greatly improves sensitivity and specificity over CT alone for the staging of a variety of malignancies. The complementary combination of the 2 modalities performs best of all. Increased uptake of FDG can clearly show neoplastic involvement of subcentimeter nodules that would otherwise have been missed on CT alone. 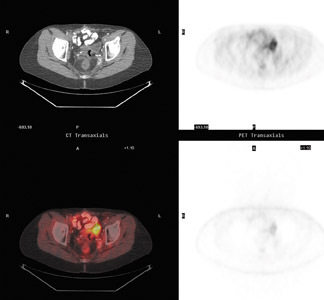 Detection of residual tumor in a mass after treatment can be assessed promptly by PET rather than relying on serial anatomical imaging to assess for any change in size. Obviously, accurate disease staging is crucial to treatment planning and to determine the goal of radiation therapy (no treatment, curative, or palliative). Discovery of widespread or distant spread of disease could change the goal of RT from cure to palliation or no treatment. In a patient with cervical cancer (Figure 10), the detection of occult disease in the mediastinum by PET/CT changed the treatment plan from attempting a cure (with 6 weeks of combined chemotherapy/RT plus 2 hospital stays and brachytherapy) to palliation with standard radiation fields. The more accurate staging by PET/CT spared the patient the morbidity and potential mortality associated with the toxicity of therapy intended to eradicate all disease. In a patient with non-Hodgkin’s lymphoma (Figure 11), CT found only the lesion in the right glenoid, but FDG-PET/CT showed multiple sites of bone involvement, including the left femur. The findings from the PET/CT altered the treatment plan from local radiation for 5 weeks with chemotherapy to the consideration of transplant as the only option for cure and radiation only for treatment failure. FDG-PET/CT can be used to optimize the treatment plan by improving delineation of the entire extent of disease so that the treatment field can be appropriately increased or decreased. Even a single positive node just outside of the field of treatment will result in failure of therapy. At the same time, FDG-PET/CT also allows for minimizing toxicity by decreasing elective nodal irradiation and treatment of normal tissue that could not be distinguished from diseased tissue by conventional anatomic imaging. In a patient with cervical cancer (Figure 12), PET/CT detected nodal disease occult on the diagnostic CT and, therefore, the treatment fields were modified to include this disease, which otherwise would have been at the border of the field. Without the PET/CT, the nodal disease would have been missed, leading to treatment failure and certain death. Figure 13 shows a patient who had both esophageal adenocarcinoma and chronic lymphocytic leukemia (CLL). Unlike esophageal cancer, CLL has a low metabolic rate and therefore no increased uptake of FDG. The treatment field could therefore be adjusted to spare the adenopathy in the abdomen and the subsequent toxicity, particularly to the radiation-sensitive bowel. FDG-PET/CT assesses early response to RT and can also be used for the detection of disease recurrence. A patient received RT for recurrence of cervical cancer at the pelvic sidewall (Figure 14, A through D). At 3 months after RT, there was diffuse faint activity at the site of disease, which was compatible with inflammation, and there were no new sites of disease (Figure 14, E through H). At 6 months, there was no significant activity at the site indicating that the faint uptake at 3 months was inflammatory in origin (Figure 14, I through L). 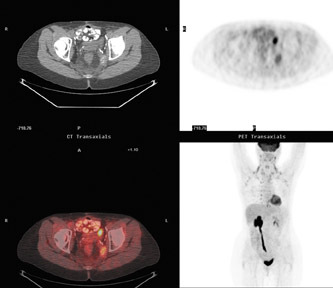 Unfortunately, the patient had a recurrence of disease at this pelvic sidewall site that was detected on PET/CT 24 months after completing radiation (Figure 14, M through O). This case highlights the concern that activity from the inflammation from radiation could potentially mask low-level activity from residual disease; however, in this case, the false-negative FDG-PET was likely due to microscopic disease below the level of resolution. Communication between the radiologist/nuclear medicine physician and radiation therapist is paramount for this complex group of patients. One example of tissue with increased physiologic uptake of FDG is brown fat, as shown in a case of restaging for lymphoma (Figure 15). In a patient with lung cancer, asymmetric increased activity in the neck represented uptake in the musculature of the left vocal cord due to unilateral right vocal cord paralysis rather than neoplasm (Figure 16). Adenopathy in the right tracheoesophageal groove damaged the right laryngeal nerve. 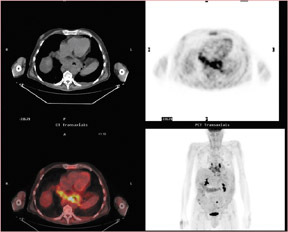 FDG-PET/CT optimizes treatment planning by providing more accurate and appropriate treatment. In combination with IMRT, FDG-PET/CT allows 1) dose escalation to tumor, 2) decreased dose to normal tissue, 3) decreased acute toxicity, 4) the possibility of better tumorcure, and 5) (it is hoped) less long-term toxicity. PET/CT has the advantages of both modalities by fusing the physiologic data from PET onto the anatomic data from CT. 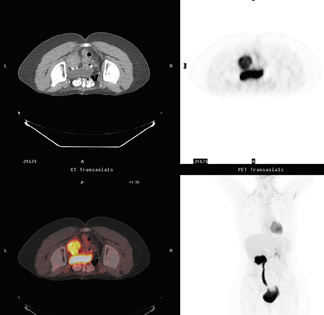 Integrating PET/CT into the planning of radiation therapy is readily achievable. Upfront, PET/CT impacts the treatment goal of RT through improved staging. Next, PET/CT optimizes the treatment plan to increase the radiation dose to the tumor and decrease the dose to sensitive organs (improving the therapeutic ratio). After treatment, PET/CT can be used to monitor response to treatment and assess for recurrence. 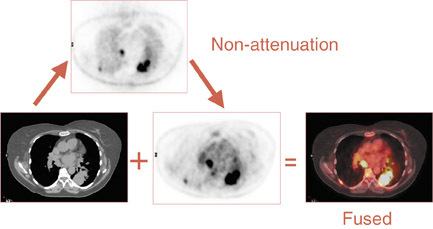 All of the advantages of PET/CT for RT are predicated on the proper interpretation of this multimodality technology, which has its own unique pitfalls. The authors thank Geri Mancini for her invaluable assistance with illustrations. Allen-Auerbach M, Quon A, Weber WA, et al. 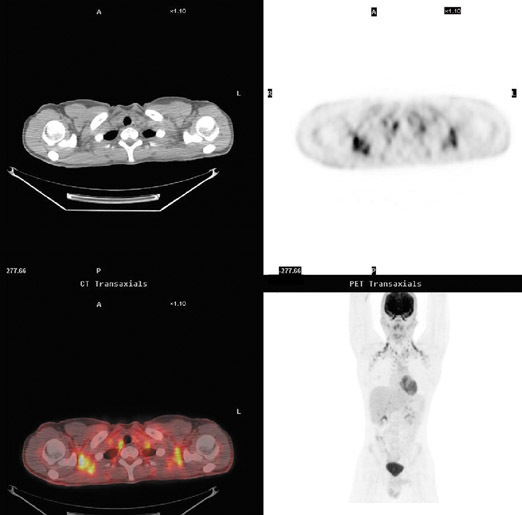 Comparison between 2-deoxy-2-[18F]fluoro-D-glucose positron emission tomography and positron emission tomography/computed tomography hardware fusion for staging of patients with lymphoma. Mol Imaging Biol . 2004:6:411-416. Beyer T,Townsend DW, Brun T, et al. A combined PET/CT scanner for clinical oncology. J Nucl Med. 2000;41:1369-1379. Branstetter BF 4th, Blodgett TM, Zimmer LA, et al. 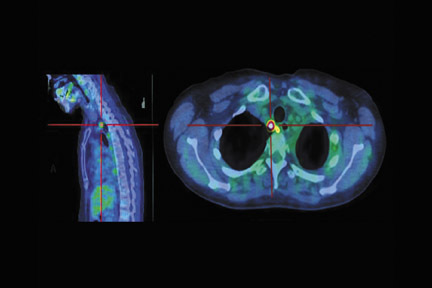 Head and neck malignancy: Is PET/CT more accurate than PET or CT alone? Radiology . 2005;235:580-586. Reinartz P, Wieres FJ, Schneider W, et al. Side-by-side reading of PET and CT scans in oncology: Which patients might pro&#64257;t from integrated PET/CT? Eur J Nucl Med Mol Imaging .2004;31:1456-1461. Schaefer NG, Hany TF, Taverna C, et al. Non-Hodgkin lymphoma and Hodgkin disease: Coregistered FDG PET and CT at staging andrestaging-Do we need contrast-enhanced CT? Radiology. 2004;232:823-829.
von Schulthess GK, Steinert HC, Hany TF. Integrated PET/CT: Current applications and future directions. Radiology . 2006;238:405-422. Cherry SR, Sorenson J, Phelps M. Physics in Nuclear Medicine , 3rd ed. Philadelphia, PA: Saunders; 2003. Cook GJ, Wegner EA, Fogelman I. Pitfalls and artifacts in 18FDG PET and PET/CT oncologic imaging. Semin Nucl Med. 2004;34:122-133. Townsend DW, Beyer T, Blodgett TM. PET/CT scanners: A hardware approach to image fusion. Semin Nucl Med . 2003;33:193-204. Cornforth MN, Bedford JS. A quantitative comparison of potentially lethal damage repair and the rejoining of interphase chromosome breaks in low passage normal humanfibroblasts. Radiat Res. 1987;111:385-405. Brown JM, Wilson G. Apoptosis genes and resistance to cancer therapy: What do the experimental and clinical data tell us? Canc Biol Ther . 2003;2:477-490. Weidhaas JB, Eisenmann DM, Holub JM, Nallur SV. A Caenorhabditis elegans tissue model of radiation-induced reproductive cell death. Proc Natl Acad Sci U S A .2006;103:9946-9951. Bradley J, Thorstad WL, Mutic S, et al. 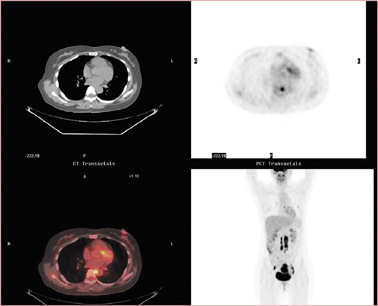 Impact of FDG-PET on radiation therapy volume delineation in non-small-cell lung cancer. Int J Radiat Oncol Biol Phys . 2004;59(1):78-86. Comment in: Int J Radiat Oncol Biol Phys . 2004;59(1):4-5. Intensity Modulated Radiation Therapy Collaborative Working Group. Intensity-modulated radiotherapy: Current status and issues of interest. Int J Radiat Oncol Biol Phys. 2001;51:880-914. Comment in: Int J Radiat Oncol Biol Phys . 2002;53:1088-1089. Juweid ME, Stroobants S, Hoekstra OS, et al. 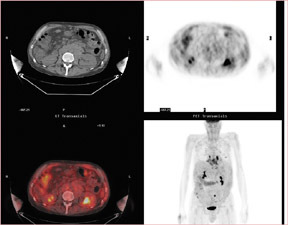 Use of positron emission tomography for response assessment of lymphoma: Consensus of the Imaging Subcommittee of International Harmonization Project in Lymphoma. J Clin Oncol. 2007;25:571-578. FDG-PET-CT for planning of radiation therapy. Appl Radiol.